On a DIY site clone request come in quite often. With the prices of commercial juice, it is reasonable that you want to replicate that taste and make it economical. There is nothing wrong with that. Most people that got into DIY did so for that very reason. So now you are standing over the rabbit hole and ready to dive in. How do you go about cloning your favorite recipe? Well, not to break your heart, but chances are you won’t duplicate it as a 1 for 1 clone. But don’t be discouraged. Along the way you may mix something that is better than what you were paying such a high price for. And at a fraction of the cost! But I may be getting ahead of myself. You simple may want to know if someone has duplicated your favorite juice and want send out a becaon to the elite mixers that have done so. Here are a few thing to try before you send out the bat signal. Have you searched using Google? Google lead me to e-Liquid Recipes (ELR). It is also my go to when I’m looking to duplicate something and I can’t find it in the massive data base we have here at ELR. Have you searched the recipe side of the site? From the recipe side of the site click on e-Liquid Recipes. 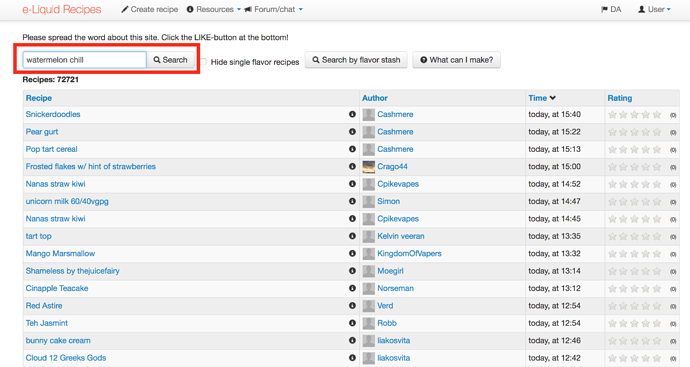 In the search engine type in the recipe you are looking for. Then click on “ratings”. 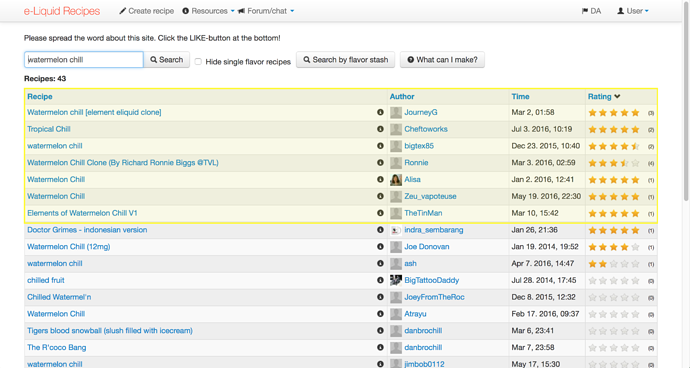 This will bring up the top rated recipes from your search. Then you will be at this point. Now that you have exhausted those options, what next? This is where you do the work. Help the mixers help you. Here are some simple guidelines that will be beneficial in your quest. This is an example of what you thread title should look like. The name and manufacturer of the juice. Watermelon Chill by Element Vapes has been my ADV for 8 months! I can’t get enough. A link to the description of the juice. Your description of the juice. What do you taste on the inhale? What do you taste on the exhale. Try to describe in detail everything you get out of the flavor. This one thing alone helps immensely. If you have attempted the recipe already the mixers here may be able to help you with percentages, different flavor brands, additives to tweak your recipe. It also shows initiative. Have you made your flavor stash public? Show us what you are working with! You may have a hidden flavor in there that you never thought of using. Something that may make a fruit pop. That may make a cream, creamier. I hope these guidelines will help you on your quest to clone your favorite juice! Good luck and have fun!!! Have a clone, or working on one? [REQ] Cloning a local shops juice? [REQ] Rounds Eliquid Apple Kiwi recipes! Help! Looks sticky worthy to little ol’ me! @JoJo @Ken_O_Where possible sticky if you think it would help? Any errors I take credit for. That was really nice of you to help people! Along the way you may mix something that is better than what you were paying such a high price for. I just have to second this. Sooo true. Once you learn how to tailor recipes to your own tastes you will probably like them more than whatever you were trying to clone in the first place. I almost hate to admit, I never realized “ratings” was clickable… Thanks for the post! My ELR experience just got a whole lot better! Did’nt really think that was even possible. Well said and well done brother. nicely put and informative. This will help those needing it as well as those providing the assistance. Also, when starting a request… Please use the title format [REQ] Watermelon Chill by Element Vapes for example. Edit made to include that. Thanks for your help my friend!